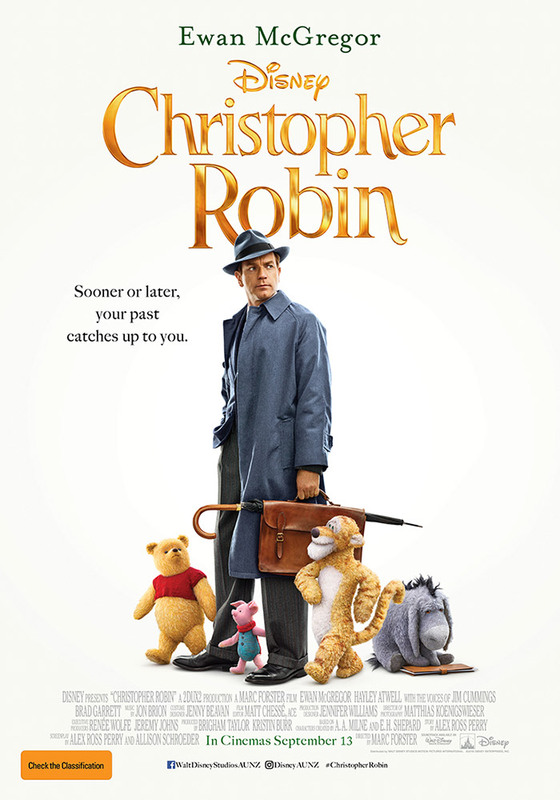 Christopher Robin (Ewen McGregor) is struggling to balance his work and family life when he’s greeted by an old childhood friend, Winnie the Pooh. Pooh, along with his fellow furry friends will help Robin rediscover the joys of life. So when the first teaser trailer for this film dropped, I was a bit taken aback by the design of Pooh. Pooh looked like something out of a nightmare in that first teaser, in what I thought was an odd aesthetic choice for the character in this live-action film. All of the fictional animal characters, created by English author A. A. Milne almost 100 years ago have been designed as living, breathing, mostly run-down stuffed teddies, devoid of any saturation. It’s an interesting design choice, and I have a feeling the characters may yet regain some of their colour (see the new poster below). In any case, this official trailer for the film squashed any literal fears I had after the first teaser, and the characters, and story, do come off as quite charming. Might need to wait for the second trailer to make a proper judgement on those. The film is directed by Marc Foster, whose past credits include films such as World War Z (2013), Quantum of Solace (2008), Stranger Than Fiction (2006) and Finding Neverland (2004). Ewan McGregor stars in the lead role as Christopher Robin, and he’s joined by Hayley Atwell, Bronte Carmichael, and Mark Gatiss in supporting roles. Pooh and friends are voiced by Jim Cummings, Brad Garrett, Nick Mohammed, Toby Jones, Peter Capaldi, and Sophie Okonedo. The film is due to hit cinemas on 20 September 2018. Check out the new trailer below, and let us know your thoughts in the comments.